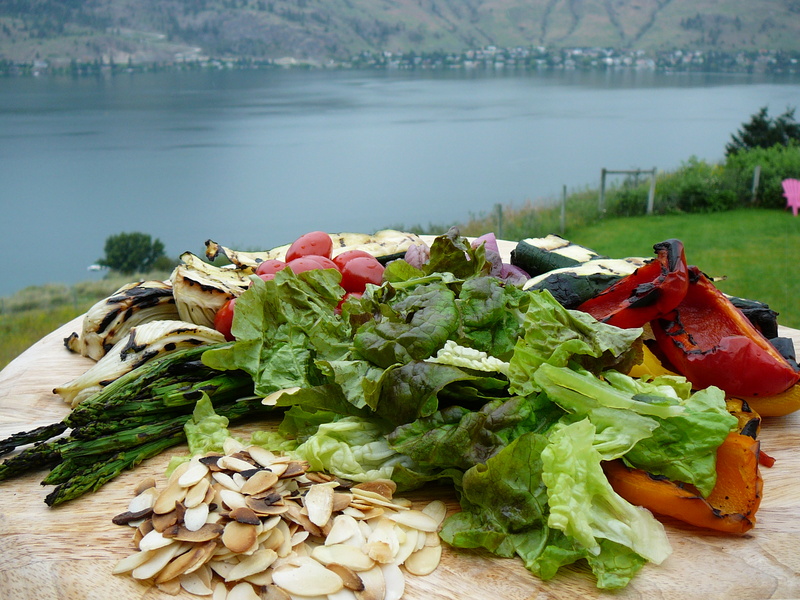 This summer salad is ready to go with any number of vegetables – take your pick, and use whatever greens are available to you …. today we are serving it with Sesame Soy Vinaigrette. Toss with vinaigrette and you have a meal ready to go. Using small processor, or immersion blender combine all ingredients except the oil and blend until smooth – then gradually add the oil until you have a delicious creamy dressing. In food processor, combine cheeses, Worcestershire sauce, hot pepper sauce and pulse until well blended – stir in 2 tbsp of the herbs. 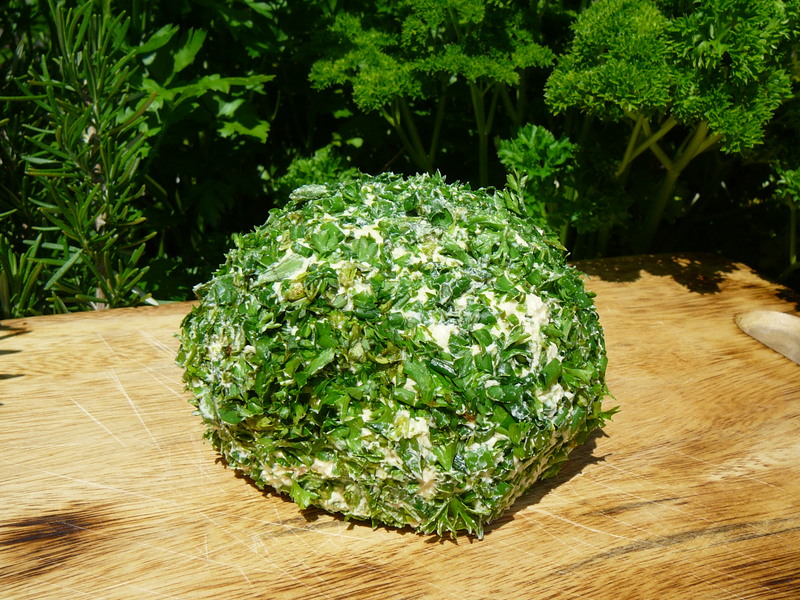 Form into a ball, then roll in the fresh herbs and chives to coat. 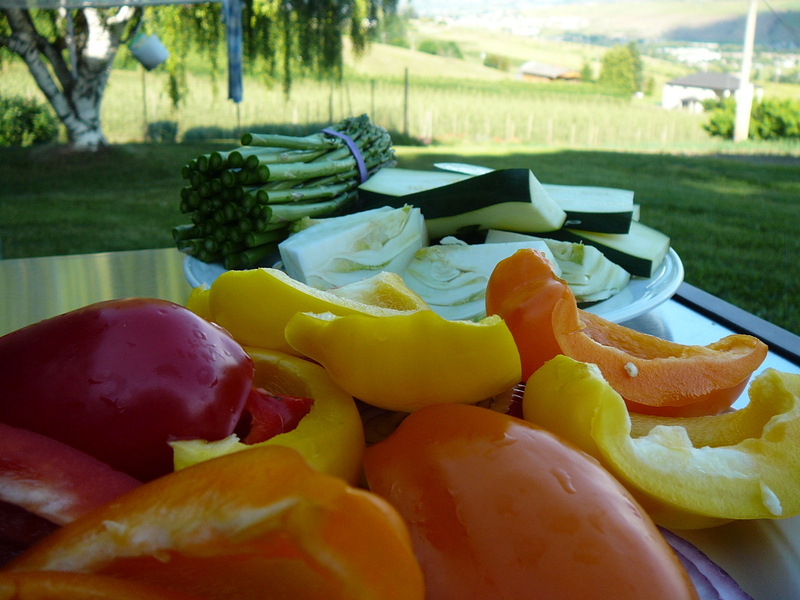 Cover tightly with plastic wrap and put in fridge for at least one hour to firm up and allow flavours to meld. Serve with bread sticks or crackers. Whip softened cream cheese and then add powdered sugar, continuing to whip. Whip cream and white sugar together until soft peaks form. Combine cream cheese with the whipped cream, as well as the citrus – zest and juice. Beat until light and fluffy, adding more orange juice if necessary. 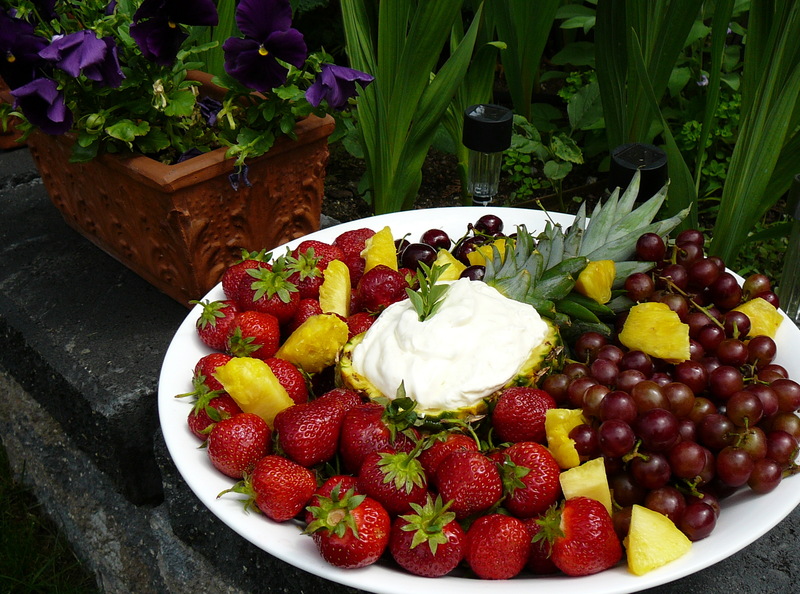 Wash and prepare your fruit, hollow out a pineapple or watermelon to use as a bowl and set out a tray with all your favorite fruits. These ribs are fall off the bone tender but so full of taste that you need to account for one whole rack per person – even more for big eaters! Make sure to serve with plenty of napkins – this will quickly become your family rib recipe. 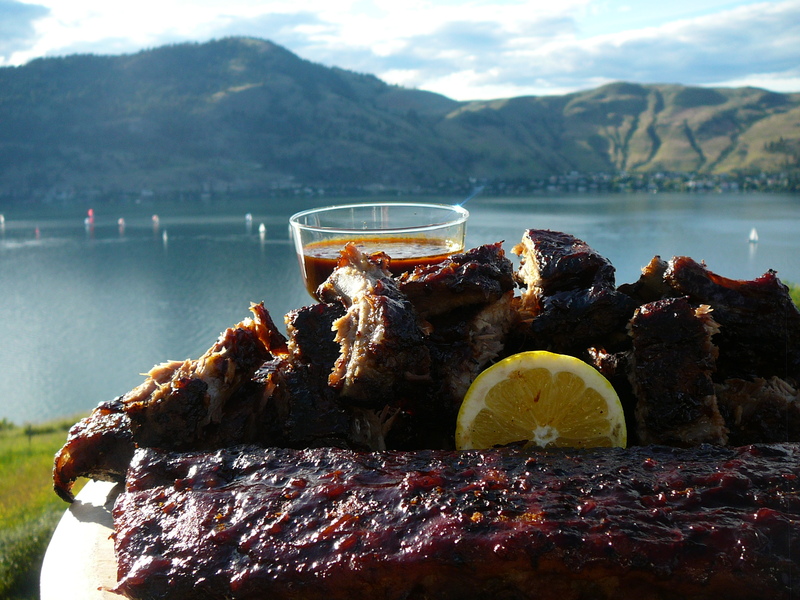 Pile of heap of grilled ribs on a platter and watch them come running! In small bowl, combine rub ingredients. 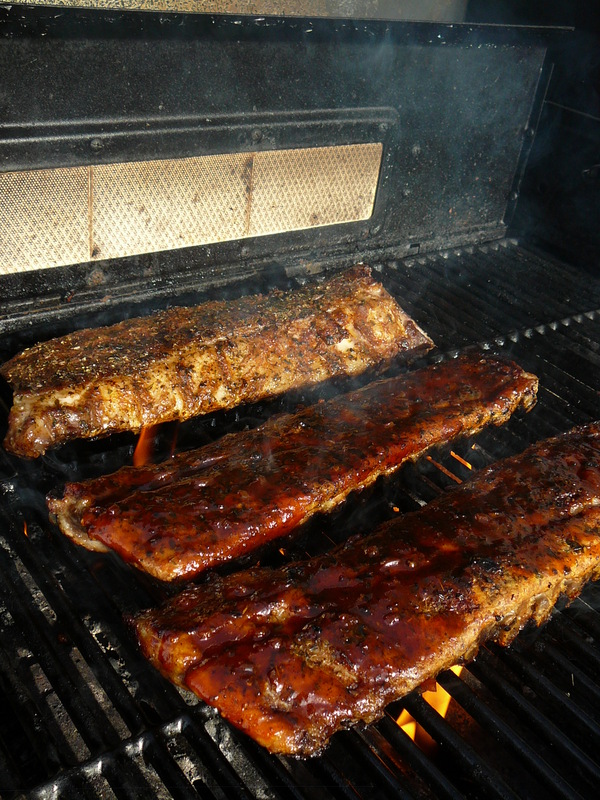 Place rib racks (whole) on 2 large rimmed baking sheets, and rub all over with seasonings, patting into meat. Cover with foil and refrigerate overnight. Meanwhile, in saucepan, melt butter, add onion, garlic and thyme. Cook until onion is very soft. Add the rest of the ingredients and let simmer quite a while, until very thick. Continue tasting until you get a nice hit of flavor. Grill or broil ribs, basting with sauce. To serve, cut in between each rib and mound on platter. Sprinkle with green onions, cut on diagonal. Serve with extra sauce for dipping and lemon wedges – a generous squeeze right before sinking your teeth into these will just make them burst with flavour. 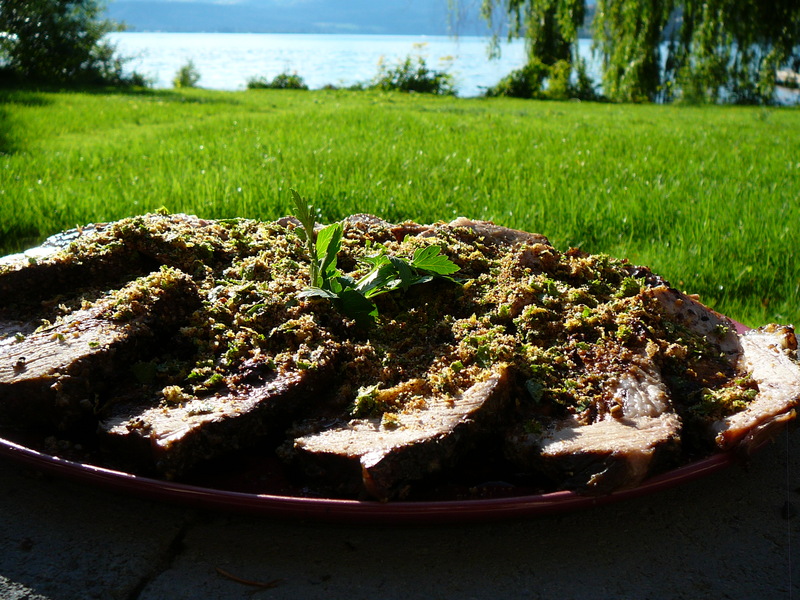 This spice rub may taste strong initially but once it has roasted on the pork, you will have a hard time getting it carved with all the fingers trying to grab pieces of the crusted edges! A great way to serve pork to a crowd – so tender and juicy. In a spice grinder, grind the coriander, fennel, peppercorns and star anise to a fine powder. Transfer the spices to a bowl and stir in the crushed garlic, salt and 2 tablespoons of the olive oil. Rub the spice mixture all over the pork shoulder roast, wrap it in plastic and refrigerate overnight. Unwrap the pork and let it return to room temperature before proceeding. Preheat the oven to 300°. Set the pork shoulder on a rack in a medium roasting pan. Pour the wine into the pan and roast the meat for about 4 hours, until an instant-read thermometer inserted in the center registers 180°. While the pork rests, toss the cherry tomatoes with the remaining 2 tablespoons of olive oil and spread them out on a rimmed baking sheet. Roast for about 20-30 minutes, just until soft. In a small bowl, stir the chopped garlic with the lemon zest, bread crumbs and parsley. Thinly slice the pork and sprinkle with the parsley mixture. Serve with the roasted cherry tomatoes. This is the best sugar cookie recipe – our family has been making it for generations – many years of cookies being decorated for any occasion. 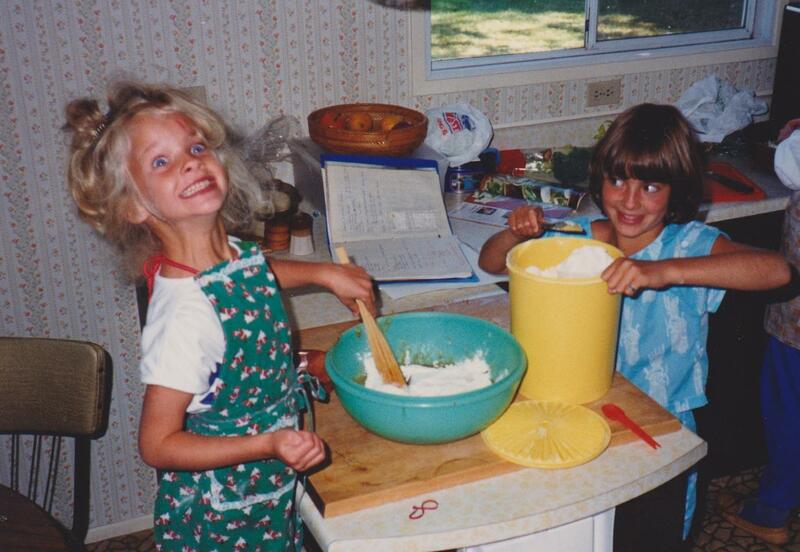 As the girls got older, the competitions heated up for making the most creative cookie. These little helpers are 32 and 30 years old now! Cream butter well, adding sugar. Beat until well incorporated then beat in eggs. Whip until light and fluffy. Sift dry ingedients together and add to butter mixture. Knead well, adding flour until dough is soft and easy to work with. Cover tightly with plastic wrap and put in fridge for one hour before rolling. 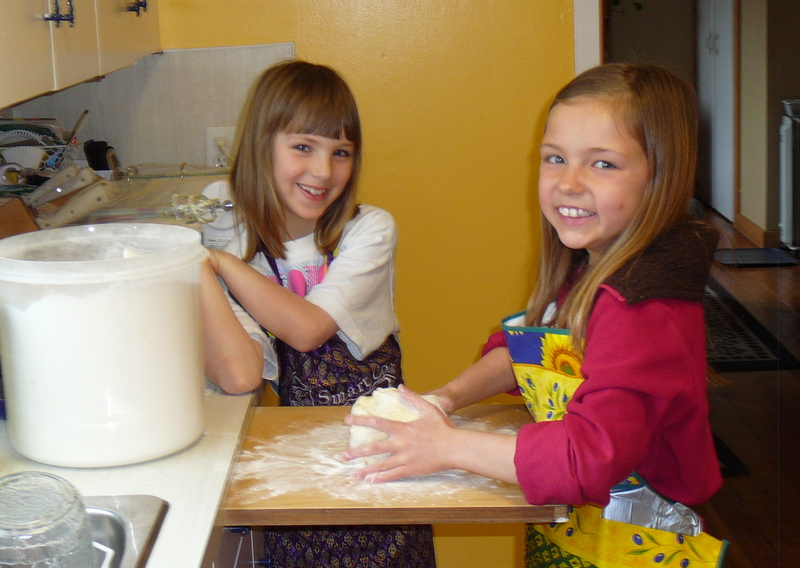 Emma and Allison always love it when they come to visit and get to help Auntie Kathy bake – decorating is the best part! Roll out on lightly floured surface and using cookie cutters, cut out shapes. Our family isn’t really crazy about icing, so we always decorate the cookies at this point with egg paint. Be careful not to get too much egg paint, or candies on the cookies – a light touch makes for better cookies, and more even baking. You can see the cookies here that just may have had a little too much decorating from the younger ones around the table! Separate yolks and whites into separate bowls. It doesn’t take much so you can make 2 colors out of each egg white, and 2 from each egg yolk. 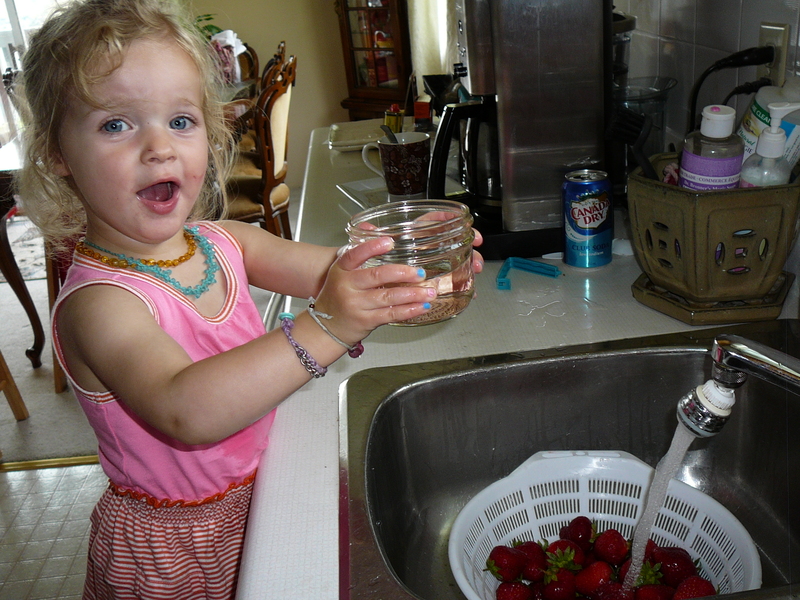 Beat each bowl lightly with a fork, adding 1 tbsp of water to each. Separate into small containers so you can make 4 different colors. Using food coloring add until you get the color you like. With the egg yolk make sure to choose a color that will work with yellow! 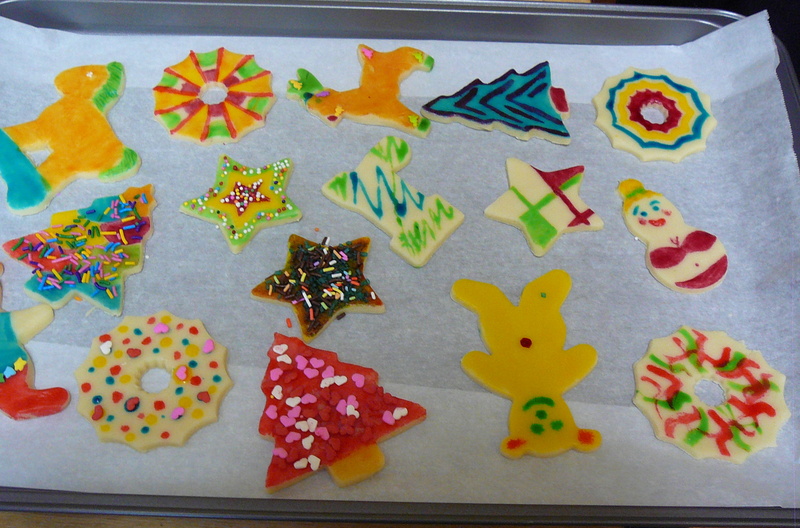 Using paint brushes, decorate the cookies while raw, then bake. 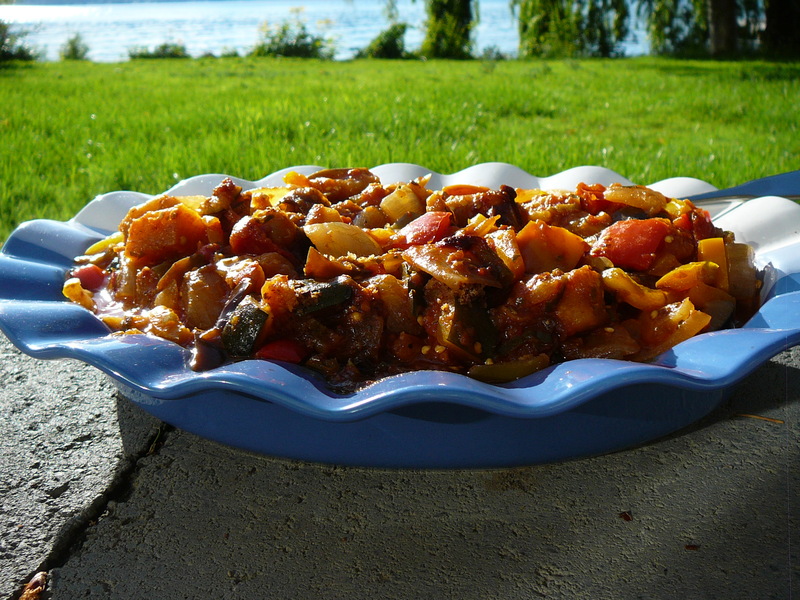 This hearty vegetable dish is so comforting, a great meal for a vegetarian or fantastic side dish for many occasions. Try it with whatever vegetables you have on hand and create your own favorite. Cover bottom of saucepan with olive oil and saute onions until they just start to soften and get little brown bits of carmelization. 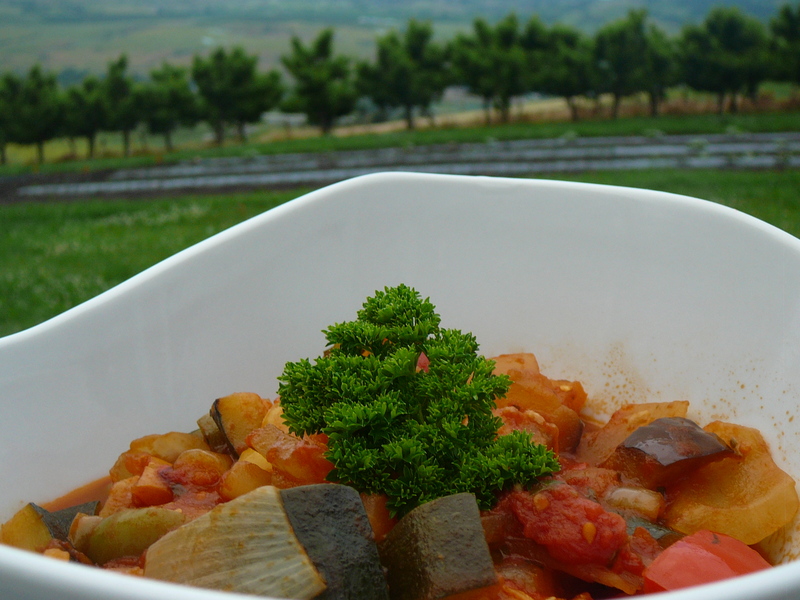 Add garlic and the rest of the vegetables – stir well and add tomatoes. Taste for seasoning and add a bit of kosher salt and freshly ground pepper as needed. Allow to stew at a very gentle boil until all the vegetables have softened and are tender, (about 30 minutes) but still hold their shape. Taste again, and adjust seasonings if needed. Don’t you just feel like a taste?